PETA conceded its request at first blush, might appear "bizarre"
PETA has asked the Pet Shop Boys to change the band's name to Rescue Shelter Boys. The duo, which has performed under its current name for more than 20 years, reproduced PETA's written request in full on its Web site. The musicians said they were "unable to agree" to the request "but nonetheless think (it) raises an issue worth thinking about." "I think I may have to stick "West End Girls" on my iPod right now to celebrate." 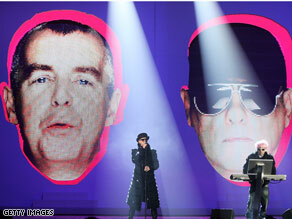 "West End Girls" is one of the many hits the group has had in its long career. PETA is no stranger to oddball campaigns. A recent one was aimed to re-christen fish as "sea kittens" because "who could possibly want to put a hook through a sea kitten?"